West side of park facing north near 65th Street. 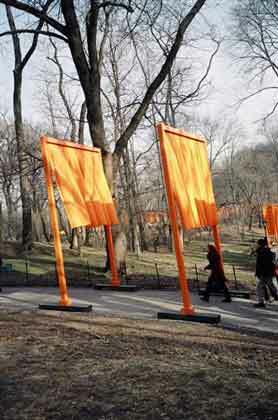 The Gates is a procession of 7,532 sixteen-foot-high frames from which hang rectangles of heavy nylon fabric, all saffron-colored and stationed at regular intervals (and some irregular, in respect for overhanging branches) along 23 miles of walkways through the 800 or so acres of Central Park. "It makes me feel like a picture. Like I'm in a picture," said Ina Angkasa to Jennifer Snow of the Village Voice. To which her mother, Grace Angkasa, added, "It does feel like we're inside the art! To be here so many times without it, now it seems like it's framing the park. It's framing the trees and the people going in and out of the color. It's exciting to be inside a color. . . ."
West side of park facing east near 65th Street. The gates are in fact pictures, rectangles of cloth stretched across the upper halves of frames, within which we occupy the lower halves, successively becoming, being, and passing to the next. Thus all of us there are in a never-ending series of pictures in which the fabric is shaped and reshaped in infinite variety by wind and light, and beyond that the gates become part of the wind and the light and the landscape, and part of the city and the larger world bordering the rectangle that at ground level is the park, the original picture, the original work of art. We are really inside the picture for this time, as we would imaginatively be inside the rectangle of a painting in a museum. On the path in front of us the intensity of color is continuous. Looking to either side and all around, the gates can always be seen; we are always aware of them as they follow the contours of paths vertically and horizontally, up and down hills, around meadows and bodies of water. Sometimes they almost disappear, but they are always there even when seeming to trail off. More completely and intricately than the landscape itself, or any work of architecture or engineering, the sequence of gates forces us to experience the space three-dimensionally. They encompass everything, and within the rectangle, three avenues wide and 50 blocks long, there is no end to them. There are no final destinations or rewards, except those that are encountered inside this giant frame, and inside the confines of our own contemplation. West side of park facing south near 65th Street. In the Dictionary of Folklore Mythology and Symbols by Gertrude Jobes, a GATE (GATEWAY) is "Passageway, security. Anciently symbolized the portal by which the dead acquired rebirth into a new form of existence; means of communication between the living and the dead. . . . Market places and places of justice were set up near the gate; public proclamations were read at the gate. People assembled at the gate to spend their leisure hours, thus the gate was coupled with drunkards, idlers, loungers. . . . Because a gate appears between two pillars it symbolizes the feminine and masculine principles in nature. . . ." One enters Central Park through openings in the perimeter wall that completely encircles the park. Frederick Law Olmsted and Calvert Vaux, who designed the park in 1858, called them gates, as Christo and Jeanne-Claude have noted--Merchants' Gate, Scholars' Gate, Engineers' Gate, and so forth--as though to invite in all the trades and professions of New York (at least the more respectable ones), those who had so miraculously put the city together, to gather in one secure place, creating a kind of paradise for them. These are not really conventional gates, of course, just entrances, though, in the plans of their creators, perhaps, not as democratic and egalitarian as they have since become. 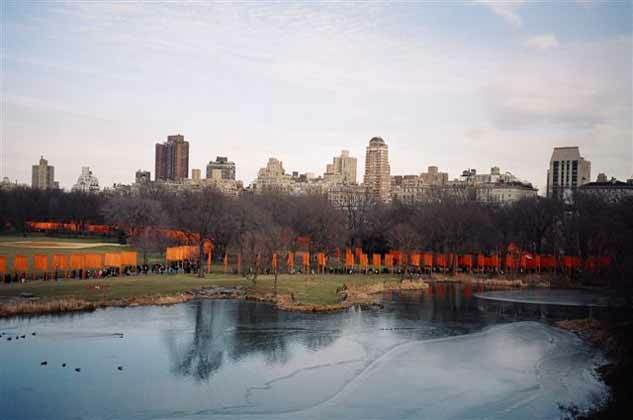 Now, during this brief time in 2005, preceded by 26 years of proposals and drawings by the artists (the latter by Christo), there are thousands of gates through which to pass, each representing a renewal, a change, a difference, moving toward constant renewal and change and difference. They comprise a journey, of course, one that passes through the natural world (or an arrangement of the natural world that cannot help but be the natural world), through time and history, through the lives and struggles of people who have been and are ranged around and inside this long, narrow rectangle. Facing east from Belvedere Castle. Though full of energy and activity, Central Park is never a rowdy place. There are restaurants, a great museum, a castle, an outdoor theater, a carousel, a band shell, playgrounds, and a zoo, several of the facilities added long after work was completed on Olmsted's and Vaux's original design, and there are people running, skating, boating, playing softball, playing soccer, walking their dogs, walking their children, walking, riding horses, listening to concerts on the Great Lawn. 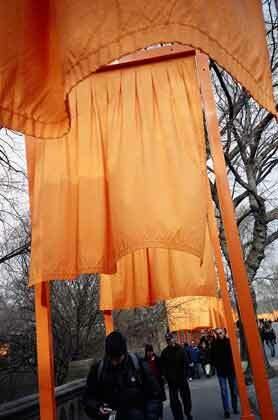 The winding saffron line of the gates appeared to encompass all this and to represent the contemplative spirit that underlies every bit of energy in the park. The path offered a place from which to see and think about the world. People had never seemed so quiet, and meditative, and individual to me. Boat pond on east side of park at sunset. My daughter Kate, who is a wonderful singer, was unable to come to New York from Washington to see the gates. Later she told me she had wanted to listen to them. I wish I had known to listen more. 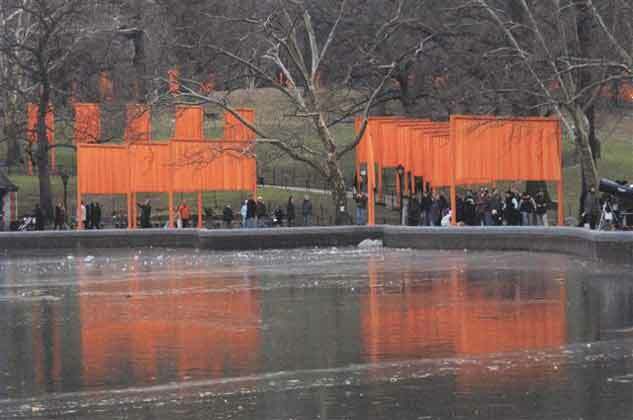 The Gates were in Central Park in 2005. 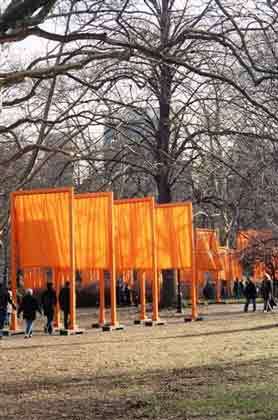 This and other work by Christo and Jeanne-Claude can be seen and read about at christojeanneclaude.net.